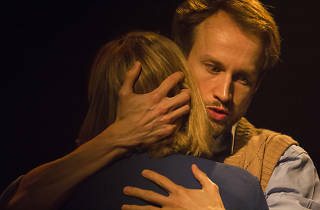 A marriage wracked by dementia forms the basis of Tristan Bernays’s new two-hander at Southwark Playhouse. It’s a marked contrast to his last play, snarky historical fable ‘Boudica’, which ran at the Globe last year. In the opening scene, piano player Tom (Mark Arends) meets academic Viv (Frances Grey) for the first time. After a few moments of flirtation, he asks her to dance. Then, after a few fumbling steps, Viv is suddenly bathing Tom: they are both elderly, and he is stricken with late-stage Alzheimer’s. In keeping with the haphazard nature of recollection, the story rejects linearity in favour of impressionism: the couple’s relationship is sketched in rather than cumulatively told. One scene flows seamlessly into the next: laughter into tears, joy into sorrow, youth into dotage, and back into youth. This back-and-forth approach would come off as a little mannered if it weren’t handled with fleet-footed direction by Sharon Burrell, and grounded in two magnificent performances from Arends and Grey. The former excels in shifting between youthful joie de vivre and crippled indignity; the latter also takes on the additional role of their daughter Alice, in one scene a toddler, a young adult in another. 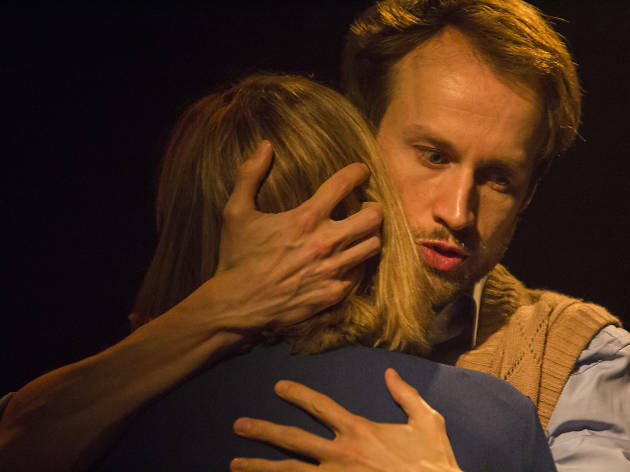 ‘Old Fools’ ultimately plays out not so much as A Play About Dementia but a light-of-touch portrait of a relationship through the prism of memory. It certainly deals with the horrors of dementia – just as chilling as the scenes of humiliating indignity is a scene where a childhood trauma is dragged up from Tom’s failing mind. Other critics have pulled this up for being a tad slight, but for my money, Bernays is to be commended for keep this a miniaturist endeavour – at an unbroken 70 minutes, this can be inhaled in one breath. Deft, restraining and moving theatre.